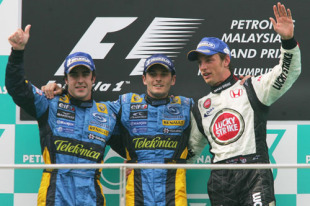 A Renault one-two was the story of the Malaysian Grand Prix in which Giancarlo Fisichella restored his reputation as a front-line driver by scoring the win from team-mate Fernando Alonso. Alonso suffered a refuelling problem prior to Q3 which left the car laden with fuel, and therefore running slower, in the opening stint. Amazingly, this was Renault's first one-two since 1982 but the other talking point of the weekend was an excellent qualifying effort by Nico Rosberg to take third on the grid. Fisichella grabbed the lead with Jenson Button offering opposition in the Honda RA106 which was displaying similar pace to that in Bahrain. However, Button never had the pace of Fisichella and fell away, only to be mugged by Alonso as well. Fisichella was delighted with his win, saying: "It feels so good to be back in a winning car." 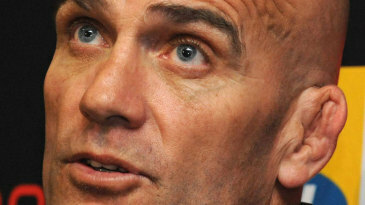 Behind him, fancied front-runners were in strife. Kimi Raikkonen was out on lap one after contact from Christian Klien's Red Bull broke his McLaren's rear suspension, while the Ferraris of Michael Schumacher and Felipe Massa struggled for grip on their Bridgestone tyres, leaving Massa fifth and Schumi sixth.